Got some friends checking into town for a weekend? Or have business folks staying long term? This new hostel, LoCul Uptown, in the posh part of town will give them the best of Bangalore. A nifty play on words give this hostel it’s name, and staying true to that, LoCul Uptown really is a good blend of local culture. 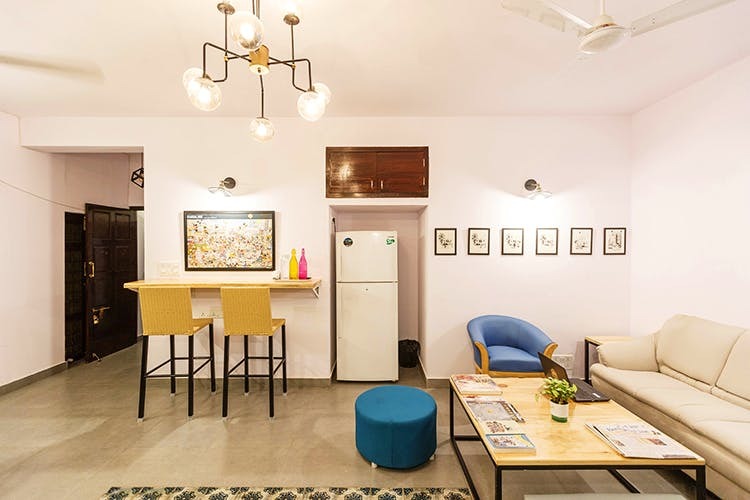 Set in a quiet lane in Abshot Layout, near ITC Windsor and the Bangalore Golf club, you’ll know why this hostel is called Uptown. But with prices per bed starting at INR 600, it a seriously good bargain for location. A large and casual lounge area welcomes you on the ground floor, and we get great Wes Anderson vibes from it — starting from the yellow and pale teal to the old school lamp-shade dramatically lighting up a Victorian clock. There are four proper dormitories, of which one is a six-bed women’s only dorm. The other three are mixed and can accomodate six travellers in one, while the other two can house four each. All the beds — bunk-bed style, have a reading (or texting or Netflixing) light for when the rest of the dorm wants to call lights out, and each also has an adorable locker for your personal belongings and effects. Each dormitory has an en suite bathroom, and this aspect wins many brownie point for LoCul Uptown. They also have private room you can stay at if you’re not a big fan of the dormitory life. The second floor is where we would hang out all day, and possibly night too. Bean bags, low seating and comfy cushions dot the space, and we can picture ourselves rounding up the troops of the hostel and having boisterous sessions of Uno, Monopoly or even poker nights. If it’s some peace and quiet you’re after, make a beeline to the charming balcony. With a ledge and chairs to either catch up on work on your laptop, watch some videos, or just gaze out when it’s raining (well, it is Bangalore), this is the spot for you. Breakfast is on the house, which is perfect for those on a shoestring budget, and for those at the hostel for a long-stay. They serve a simple toast, milk, cereal combination, though they have a menu for fresh South Indian food that is chargeable. Tea, coffee and milk is available for all guests to make in the kitchen. What makes this hostel a real winner however, is that true to its name, they are all about local culture. Sign up for their city walks, tours, and exploring plans that take you through Bangalore like never before. Be it a temple run, a beer trail or a yoga session, they’ll plan it all for you, for a small fee.